The Ultimate Guide To Wedding Proposals #Infographic ~ Visualistan '+g+"
A marriage proposal marks the beginning of an exciting chapter in a couple's life together. 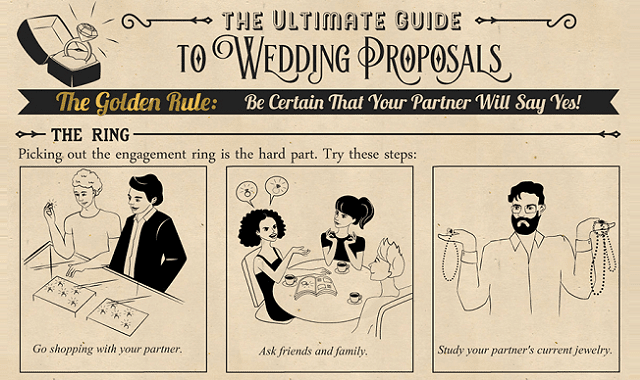 If you are planning to pop the question, you know it can be both daunting and thrilling at the same time. Depending on who you are and what your relationship is like, you may choose to be spontanteous and personal. Or, you may pour a lot of planning and effort into perfecting that magic moment. Whatever the style may be, there are some basic tips that cam help you pull it off successfully. First you must consider this fundamental question: how certain are you that they will say yes? If you have doubts, it is time to reevaluate and discuss the future with your partner. If you have no doubt about it, then proceed with the proposal! This guide offers simple, light-hearted advice that can make the process go smoothly and happily. It can help you make the proposal a memorable, cherished moment in the story of your lives together.